← When Worlds Collide #3: Warning: Doing Business is Dangerous to Your Health! When Worlds Collide #4: Riding into Healthy Cities, or Dreaming of SUVs? The late — and great – innovator Ray Wijewardene was best known for building and flying ultra-light aircraft. But he was also interested in finding ways to improve the ordinary bicycle. Ray exchanged ideas with people around the world who were trying to improve the two-wheeled design – first introduced two centuries ago – so that riders could travel faster with less effort. Always mixing functionality with good design, he wanted to enhance performance while ensuring comfort. In his garage, he built some strange looking pedalling devices. One had the rider seated in a reclined position, as in a go-cart. It certainly reduced drudgery for the rider, but wasn’t well suited for our chaotic road conditions. Once, when it was being tested on a busy Colombo road, the rider was almost run over by a bus. “Hik meeya wage aawa, dekkema nehe!” the exasperated bus driver had exclaimed (‘it appeared from nowhere – like a little mouse!’). From then on, Ray fixed a flag on a flexible stick so drivers in higher elevated vehicles could easily spot the advancing bicycle. Of course, that by itself is no guarantee of rider safety. The sad truth is that Lankan roads and public spaces are simply not cyclist friendly. Dedicated bicycle paths and cycle parking spaces don’t exist. Our ‘mean streets’, especially in the cities and towns, are hazardous for cyclists. Cyclists and pedestrians regularly risk being hit by larger vehicles, especially buses and lorries. Few would ride if they have any choice. Those of us who knew and loved Thisula Abeysekera – medical doctor turned country singer – still remember her fatal cycling accident in May 2006. She was knocked down by a bus on a Sunday afternoon on a deserted Colombo road. 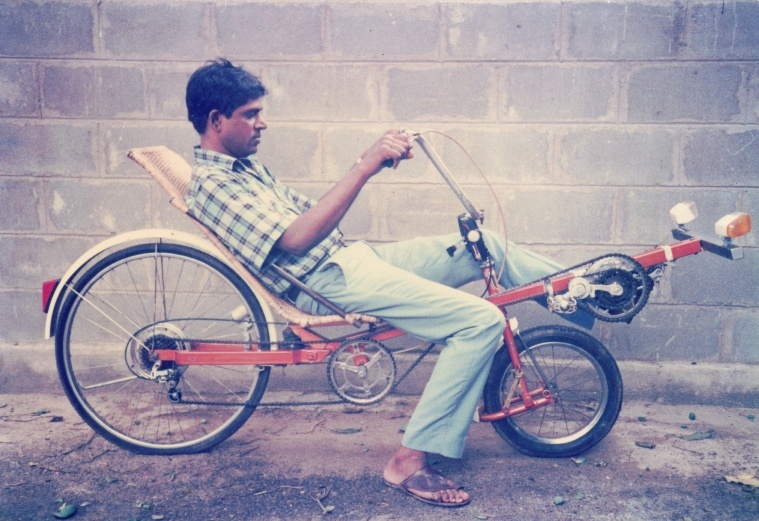 So when some suggest that we must take to cycling to cope with the drastic fuel price hike, I wonder if they really live on the same island of Lanka. Oh, I do appreciate how cycling is good for health and the environment. I just want solutions to be practical and safe – and not rooted in some romanticised ideal. Few environmentalists who extol the virtues of cycling practise it themselves. Beyond a mere political stunt, do any of our elected officials ever cycle? Despite this, the bicycle doesn’t rank high in public perceptions. Often, it is seen as the first rung on the ‘ladder of prosperity’ – people aspire for motorised transport as soon as they can afford. Vehicle ownership is not simply a matter of mobility; it is a status symbol. Perched at the top of this ‘value pyramid’ are the highly inefficient sports utility vehicles (SUVs, a.k.a. Pajeros in Sri Lanka). In such a society, who speaks for the humble bicycle? How much – or how little – do our transport planners care about cycling? Or walking for that matter? The development of roads and cities in South Asia is very much car centred. The interests of buses and trains come next, followed by three-wheelers. All these modes have either lobby groups or trade unions. In that hierarchy, the bicycle, bullock cart and rickshaws (still used in part of the Indian subcontinent) barely register says Anumita Roychowdhury, executive director (research and advocacy) at the New Delhi-based Centre for Science and Environment (CSE). Yet these are the least polluting modes that can be part of a sustainable transport mix. Going low tech isn’t incompatible with modernisation! In May 2011, CSE, one of India’s leading environmental think-tanks, released a new analysis of Sri Lanka’s urban air quality and mobility related challenges. It noted that Colombo, like Delhi, is facing a serious air pollution problem. The toxic risk is arising mostly from the rapidly growing numbers of vehicles, many of which run on low quality diesel currently used in these two countries. In Greater Colombo, vehicle fumes cause at least 60% of the total air pollution. The transport sector contributes the most to increases in sulphur dioxide and nitrous oxide emissions. I moderated a panel discussion when CSE launched its findings to journalists in Colombo. Among my panellists were two ardent cyclists: Priyanthi Fernando, Executive Director of the Centre for Poverty Analysis (CEPA) and Dr T L Gunaruwan, a Senior Lecturer in economics at the University of Colombo and a former Secretary, Ministry of Transport and one time General Manager of Railways. They both lamented the absence of cycle lanes and a safer road environment so more people can use non-motorised transport. 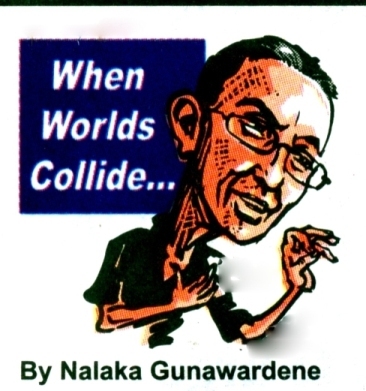 Dr Gunaruwan astonished most of us when he revealed how he used to cycle between Colombo and Panadura along the always busy Galle Road. That 25km ride is not for the faint-hearted! A sceptic pointed out that cycling is not easy in hot and humid Sri Lanka. Cyclists argued they will make lifestyle changes if our roads are friendly to them. This entry was posted in Innovation, Sri Lanka, Transport and tagged Anumita Roychowdhury, bicycles, Centre for Science and Environment (CSE), Cyclists, Dr T L Gunaruwan, low quality diesel, nitrous oxide, Priyanthi Fernando, Ray Wijewardene, sulphur dioxide, SUVs, Thisula Abeysekera. Bookmark the permalink. 1 Response to When Worlds Collide #4: Riding into Healthy Cities, or Dreaming of SUVs?